Our Ham Hock Stock is an easy way to create an amazing depth of flavor in Cajun foods, soups, stews, collards, beans and so much more. We utilize smoked ham hocks and cook them down until they fall off the bone and impart incredible taste! We are big believers in using the freshest ingredients possible, it’s a key factor in enhancing the flavors and quality of any dish. This is a back to basics method, use up vegetables or herbs that you have on hand or follow our recipe to a tee. You can’t go wrong, but there is one hard and fast rule! Don’t add any salt at this time, due to the salt content in ham. You will adjust for taste after the stock finishes cooking. 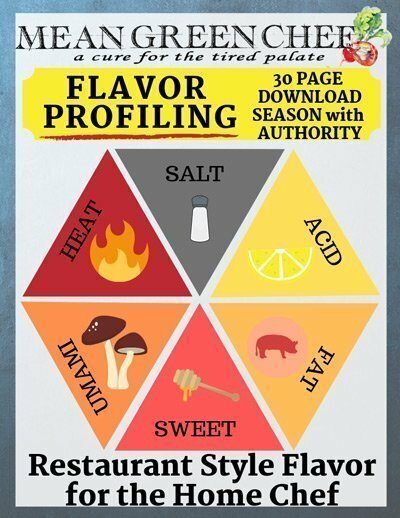 Season With Authority, Restaurant Style Flavor For The Home Chef! Get the latest in kitchen science, recipe creation, food photography and more by joining our weekly email list! What can I make with Ham Hock Stock? You can add this ham stock recipe to virtually anything you want to impart a smokey flavor in. 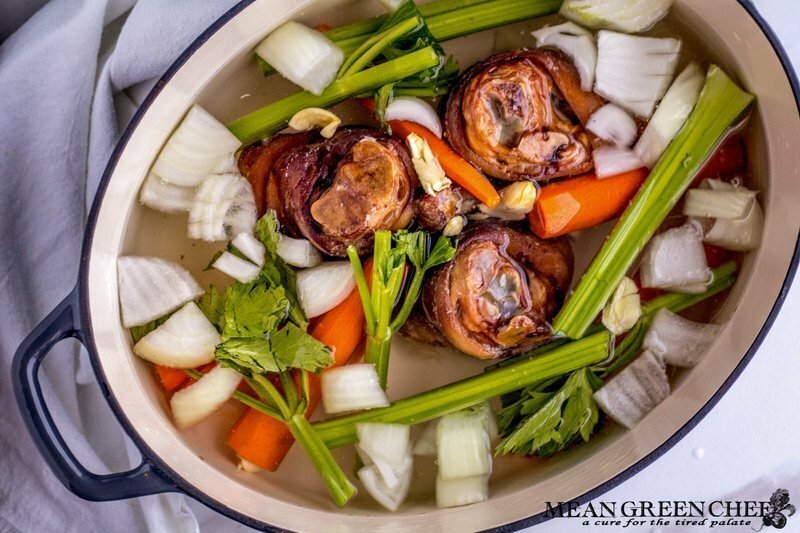 Place the ham hocks in a large heavy-bottomed Dutch oven or stockpot. Cover with water and bring to a boil, as soon as the water comes to a boil, pour it off. Then rinse the ham hocks and the pot, return the hocks to the washed out pot. This cooks off impurities on the hocks. Scrub the vegetables and cut any large pieces in half, then add them into the pot with the hocks. Pour the 4 quarts of cold water in slowly to avoid breaking up the fat on the hocks, which could cause the stock to become greasy and cloudy. The water should just cover the ingredients. Place on medium-high heat and bring to a slow rolling boil, lower heat to medium-low. Turn down the heat even more. You want the barest of simmering going on – the occasional bubble every few seconds. This is so that the collagen in the meat melts and dissolves, which flavors the stock. As the stock cooks occasionally skim the surface to remove the foam. For the first half an hour, continue to check back and skim off any foam that has risen to the surface. After this time has passed, the foam should subside and you can check back every hour or so and give the pot a gentle stir, to keep the ingredients from drying out. As the liquid reduces the flavor will become more concentrated. After 4 hours check for flavor, it should be seasoned beautifully at this point. Remove the ham hocks to a platter and set aside. Strain the stock through a fine-mesh strainer and discard the vegetables. Allow the stock to cool if not using immediately. Ham Hock Stock can be refrigerated in an airtight container for up to 3 days or frozen for up to 1 month. Our Ham Hock Stock is an easy way to create an amazing depth of flavor in soups, stews, beans and so much more. Put the ham hocks in a very large soup pot and cover with cold water. As soon as it comes to the boil, pour the water out. Rinse the ham hocks and the pot. This cooks off impurities on the hocks. Now add all of the ingredients and bring to a boil in a large heavy-bottomed Dutch oven or stockpot. Cover partially and simmer until flavorful and ham is falling off the bones, about 3 hours. Remove the ham hocks and then strain the stock and skim off any fat from the surface. If you’re searching for other great cold weather dishes, then make sure to check out these recipes too! Did you make a Mean Green Chef Recipe? We 💙 LOVE 💚 seeing your creations! So don’t forget to tag us @meangreenchef or #meangreenchef so we can see what’s happening in your kitchen! Follow our blog on Bloglovin! Hi, I’m Angela, I grew up in New York in an Irish-Italian multi-generational restaurateur family. I’ve been in the kitchen over 35 years, and it’s still my favorite place to create. Growing up in hustle and bustle of professional kitchens was the forefront for my love of all things food. From baking bread, desserts, to hand rolling pasta and mastering the art of soup making. It was the bedrock that shaped my life. Hi, Carol 🙂 this is the perfect way to get the flavor without all the fat! Thank you so much for pinning too! Mean Green Chef is the conception of a chef and an artist who love all things food. Bright seasonal produce, fresh seafood, and quality meats inspire our recipes, courses, and photography. Get the latest in recipes, kitchen science, courses and more! © Mean Green Chef 2017 - 2019 All rights reserved. LEAR​​​​​N TO SEASON LIKE A CHEF!